Doughnuts are the sweet treat that call to people of all ages. You want a doughnut, but the high amount of sugar and refined flour make packing up the kids and making a trip to the local doughnut shop out of the question. So what are you going to do? Make your own of course! But… you don’t want a mess. Not a problem. Enter the baked paleo cake doughnut. It’s light, slightly crisp, with just enough sweetness, and a hint of nutmeg. The kitchen was a mess and the doughnuts sadly were not all I had dreamt of them being. It’s safe to say I was scared of making them for at least two decades. While I first attempted to make soaked whole wheat doughnuts, they were too muffin-like, and seriously, who wants a doughnut-shaped muffin? So I jumped into the world of gluten-free baking. Taking a break from grains, even the sourdough, soaked, and sprouted variety is always a good idea from time to time. This time I turned to coconut flour and tapioca starch. The combination of coconut flour and tapioca starch is what makes these doughnuts a work so well. 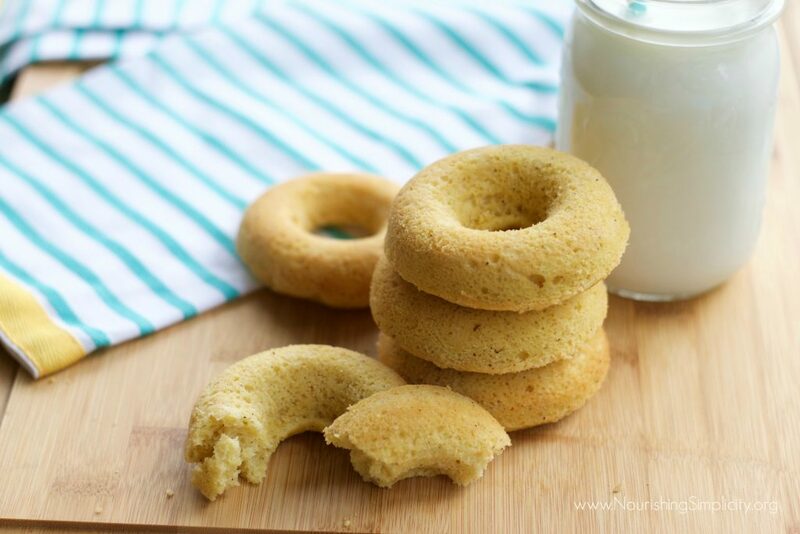 Tapioca starch adds a bit of texture that doughnuts need, while coconut flour offers the perfect softness. 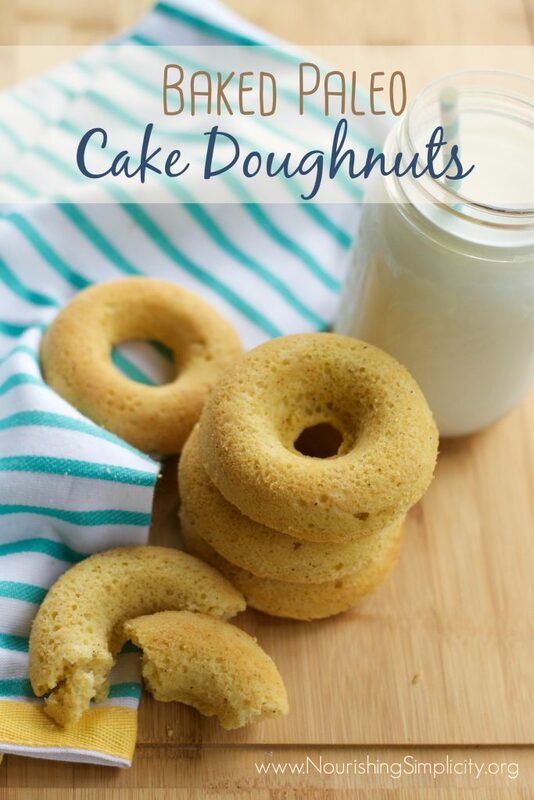 These baked paleo cake doughnuts are much better for you than your average doughnut but are still a far cry from being health-food. Just like not everything you find at Trader Joe’s or Whole Foods is going to be good for you. 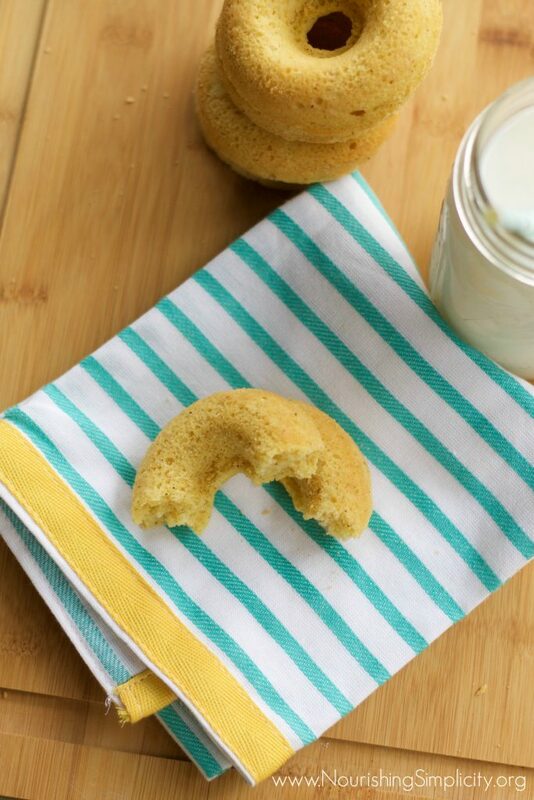 Another key to these bake paleo cake doughnuts is the coconut oil. I’m sure butter would taste just fine but coconut oil adds the perfect “crisp” factor that almost makes you think these are fried. For a fun twist, you can top them with homemade powdered sugar! *Note* I used this doughnut pan, I have two. It is non-stick which is normally a no-go in my book, but for a special treat, I’m okay with that. I tried using silicone, but was not happy with the results. In a medium sized bowl, add the coconut flour, tapioca starch, baking powder, nutmeg, and salt in a bowl. Use a whisk to mix. Add the eggs, milk, ¼ cup melted coconut oil and vanilla extract. Mix until smooth. Use the remaining coconut oil to heavily grease the doughnut pans. Pipe in or scoop batter into each mold, filling them ⅔rd of the way full. Tap lightly on the counter to get rid of air bubbles. Bake for 15-18 minutes, until the edges start to turn golden brown.Allow the doughnuts to rest in the pans for 5 minutes before removing to cool on a cooling rack. Eat plain or top with homemade powdered sugar. Bake for 15-18 minutes, until the edges start to turn golden brown. Allow the doughnuts to rest in the pans for 5 minutes before removing to cool on a cooling rack. What is your favourite type of doughnut? Love this! Can’t wait to make these for my kiddos. And the pictures are beautiful! How much coconut flour? It isn’t in the ingredients listed. 1/2 cup, I accidently wrote “coconut sugar” instead of “coconut flour”, thanks for catching that!